Four Barrel Coffee, founded in 2008, is one of the big names of San Francisco speciality coffee. Now a chain of three shops (one of which is a bakery) as well as a roaster, this branch, in the Mission, is the original. It was also, for a while, the main roastery as well. These days, roasting takes place at a dedicated facility in Oakland, but the old roaster is still there at the back of the store. In fact, the space is neatly split in two, with the coffee shop in the front, and the old roastery, now used for storage, training and cuppings, at the back. Four Barrel is unusual in that it has two counters. The main one is in the middle of the store, offering the Friendo Blendo seasonal house-blend on espresso, along with decaf, plus a rapidly-changing single-origin on bulk-brew. There is also a wide selection of cake on offer if you are hungry. Alternatively, to the left of the door, is the “slow bar”. This offers five single-origins on pour-over and another on espresso. The slow bar has limited hours, only opening from eight until three in the week and until six at the weekends. On the east side of the wide, leafy Valencia Street at the Mission’s northern end, Four Barrel Coffee fits a mould I was beginning to recognise after visits to Sightglass and Sextant (although, in fairness, Four Barrel predates them both). Occupying what feels like an old industrial building, it’s long and wide, with a low, wooden ceiling, giving way to an A-framed roof about hallway back. A more utilitarian space than either Sightglass or Sextant, it has its own particular charm. You can sit outside, where tables line the far side of the pavement, next to the busy street, or sit inside where there’s plenty of seating. Either way, you’ll have to head inside to order. The front of Four Barrel is all glass, double doors deeply recessed in the centre, leaving space on either side for a four-person window-bar. On the left is the slow bar, followed by retail shelves, while the bulk of the seating’s on the right. First, long, narrow tables project from the walls, then as you near the counter, these are placed by short, narrow tables from the walls. The seating continues past the counter, by now reduced to two-person tables. There’s more seating behind the counter, a long bar running almost the full width of the store, separating the coffee shop from the old roastery. This has a simple layout, with a vintage Probat, complete with external gears/chains, taking pride of place in the centre. On the occasional day it’s in operation, sit at the bar and watch it in action. The remaining space is given over to storage, while right at the back, another counter with espresso machines and bulk-brew equipment is used for staff training. There are small windows in the back wall and regularly-spaced skylights in the A-frame roof. The counter’s almost an island, but is attached to the left-hand wall. The front part of the store is open and uncluttered, allowing you direct access to the counter from the door, with plenty of space to wait. Just as in Sightglass, there are twin tills, one to the left, the other to the right, with the cake in the middle. Each till has its own Kees van der Westen espresso machine, while the single-origin for the bulk-brew is displayed next to the tills. Be warned, however: this can change two or three times a day! My first visit was on Monday evening, when I stopped by for a decaf cappuccino. This was served in a lovely, handleless earthenware cup. 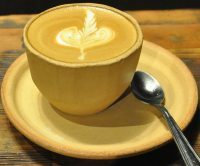 Rich and sweet, it blended perfectly with the sweetness of the milk to make a very rich, smooth drink, the excellent latte art holding the pattern to the bottom of the cup. I also had a Kovignamann, a rich pastry made of dense croissant dough, enriched with butter. Although very sweet, it wasn’t sickly sweet and was very, very tasty. I returned two days later to try the slow bar. During my visit, this had six single-origins (five pour-over through the Beehouse Dripper and one espresso), all of which were Africans, chosen, said the barista, because that’s what he likes. You order your coffee here and, if you don’t want to watch your pour-over being made, take a seat and the barista will bring your coffee to you. This is in contrast to the main counter, where the predominant American practice of hollering your name until you come to collect your coffee is still in force. I selected the Ethiopian Goljo, which was a very smooth, well-balanced coffee that tasted just as good cold as it was hot. Definitely worth returning for! You can see what fellow-blogger Bex, of Double Skinny Macchiato, made of Four Barrel when she visited as part of her own one-day whirlwind tour of San Francisco. This entry was posted in Cafe/Roaster, Cake, Coffee Shops, Evening Opening, Island Counters, Retailers, San Francisco and tagged include by Brian Williams. Bookmark the permalink.